When I was a poor college student, I worked at a bakery that, among other things, was famous for their pumpkin bread. One day, I brought a loaf home and proceeded to basically eat almost all of it and then said that I gave it to the neighbors. That was a lie. But when it comes to pumpkin bread, I have basically zero self control and I don’t feel like I should be held accountable for that. We have an amazing recipe for pumpkin chocolate chip bread here on the blog, and we have lots and lots of other pumpkin chocolate chip-y goodies on the blog, but this recipe is near and dear to my heart. 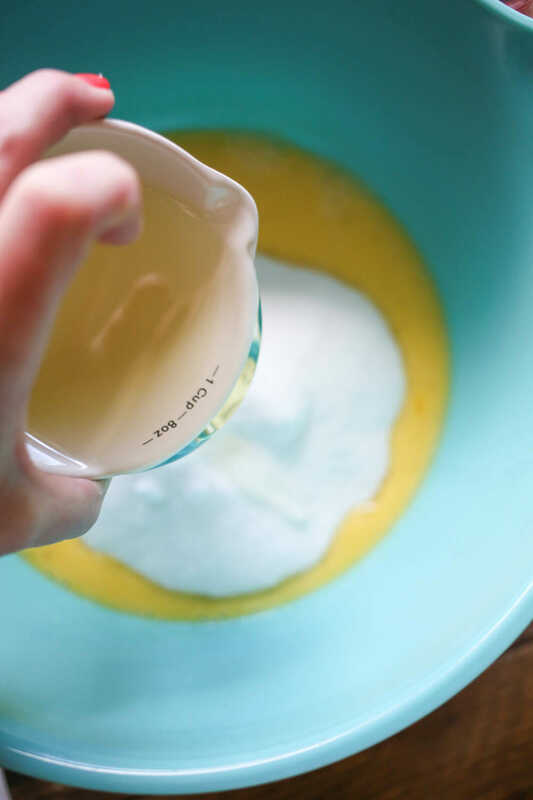 It’s one of those recipes I’ve carried with me forever now, simple and easy and delicious and perfect for weekends and after school baking fun. It’s one of those recipes that feels way too delicious for how easy it is. It’s one of those recipes that will help make friends and that you’ll get emails about years later, like, “Hey, Kate!! Long time, no see! Remember that time you brought those pumpkin chocolate chip muffins to your final Harry Potter presentation in college? Could I get the recipe?” Yeah. All these things have happened. You need this recipe. 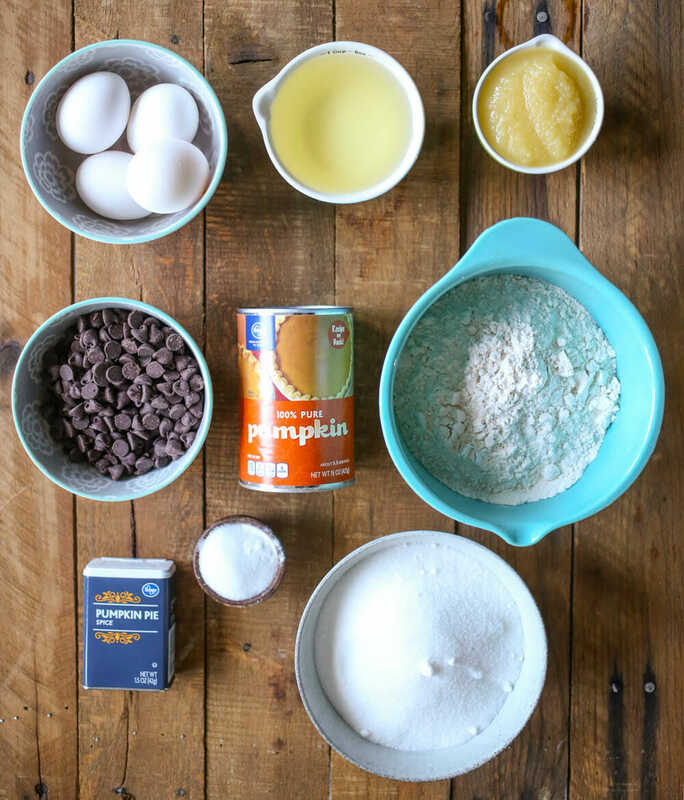 You’ll need eggs, a can of pumpkin, flour, baking soda, baking powder, pumpkin pie spice, cooking oil, applesauce, chocolate chips, and sugar. Preheat oven to 400 F. Line 2 12- cup muffin tins with paper liners. Set aside. 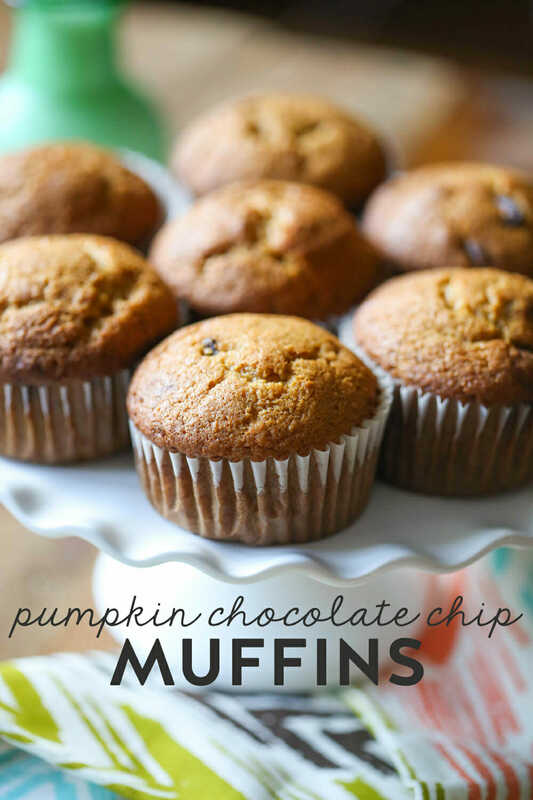 Add chocolate chips and use a 1/4 cup measuring cup or cookie scoop to add batter to muffin tins. Bak 15-20 minutes (18 was perfect for me) or until a knife or toothpick inserted into the center comes out clean. Remove from oven and allow to cool slightly then, if desired, transfer to a wire cooking rack. Preheat oven to 400 degrees. Line 2 12 cup muffin tins with cupcake liners and set aside. 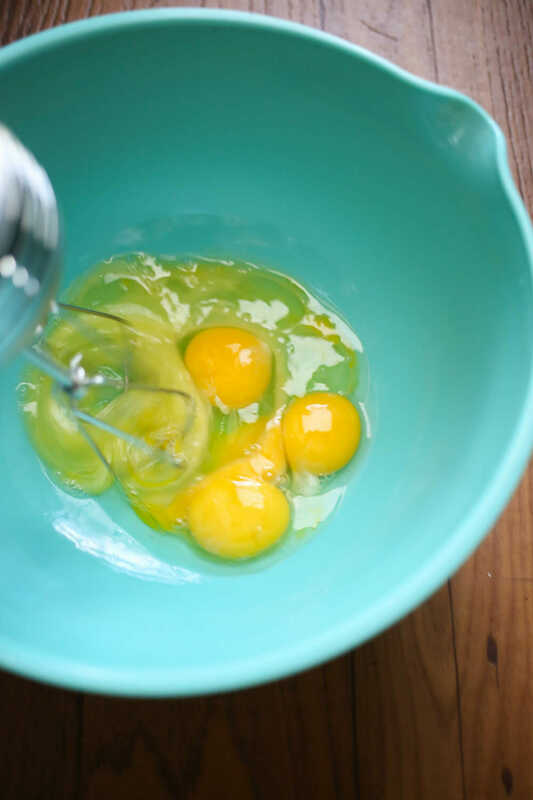 In a large bowl, beat eggs with an electric mixer. 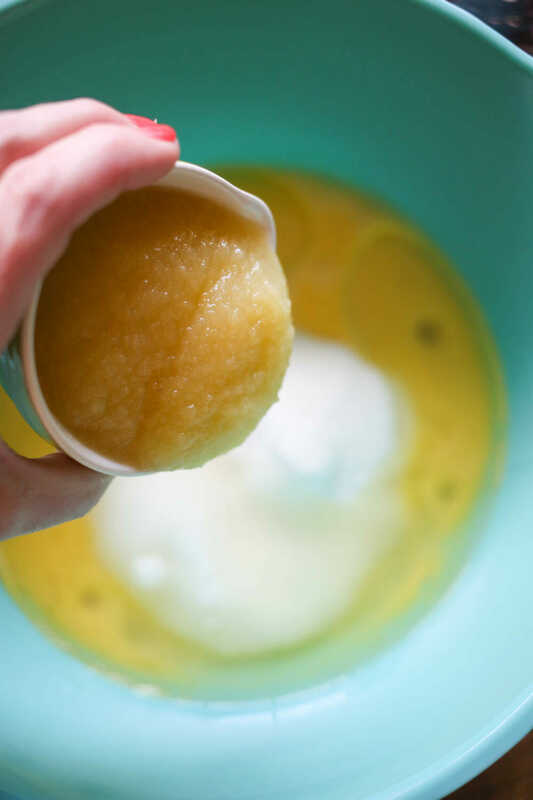 Mix in sugar, pumpkin, oil, and applesauce. 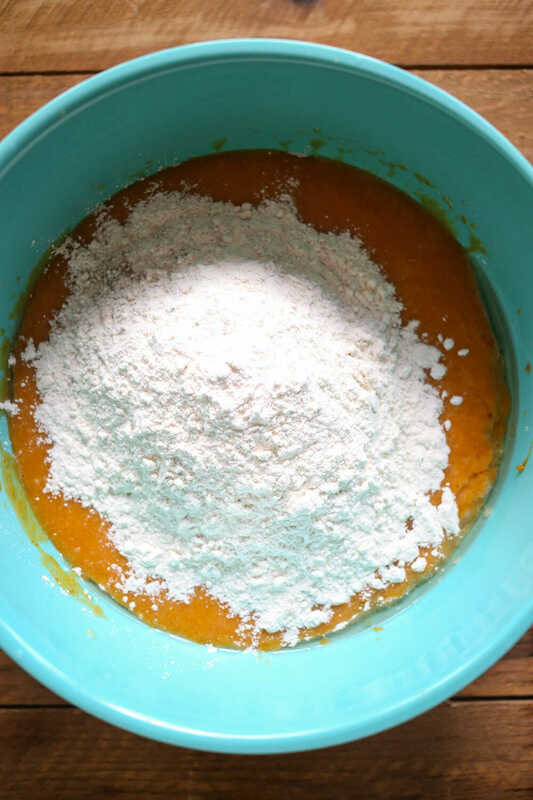 In another bowl, mix flour, baking soda, baking powder, pumpkin pie spice, and salt. 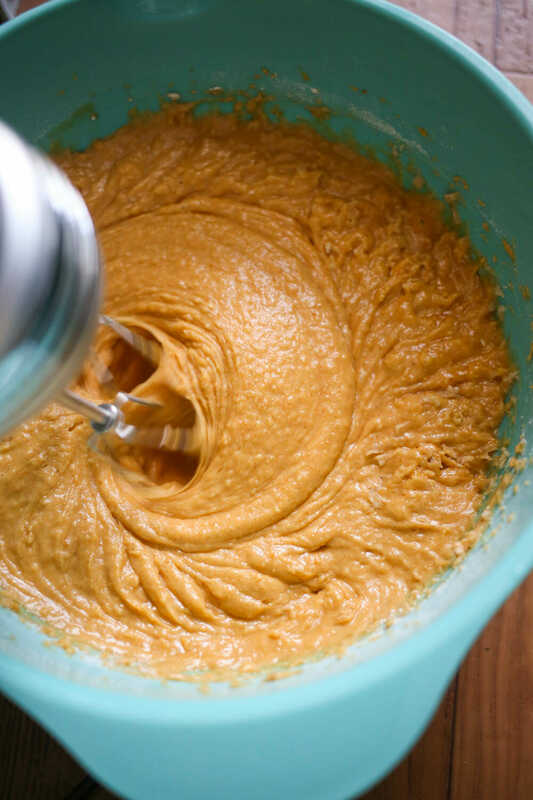 Blend into pumpkin mixture until just combined. Add chocolate chips and mix. Transfer to muffin tins (a 1/4 cup cookie scoop or measuring cup works great). Bake 15-20 minutes (18 is perfect for me) or until a knife comes out clean. Cool slightly in pans then transfer to wire racks. Ha! Yeah it’s a little glitch with our new recipe card—I’ve been trying to fix it all day…?? Hahaha, I know, right?! I’m trying to fix it, but it won’t let me…? YUM! These muffins look AWESOME! 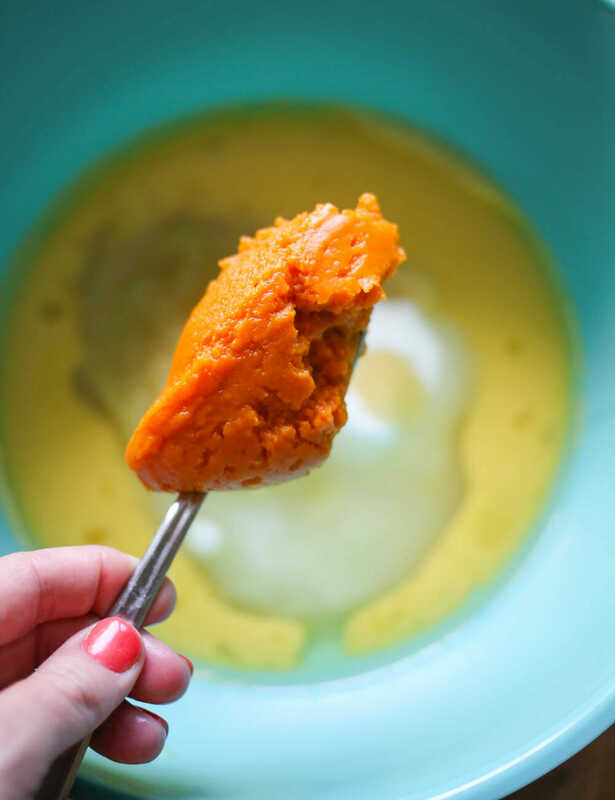 And we have pumpkin puree to use up! Well I missed the hours vs minutes thing but on my phone and computer both, I can’t print without the meal plan banner blocking the name of the recipe. Real bummer. I LOVE pumpkin chocolate chip breads! Would this recipe make 1 loaf if you didn’t want the muffins and wanted a pumpkin bread in a loaf pan instead? Sure!! I don’t know for how long, though. These look wonderful. 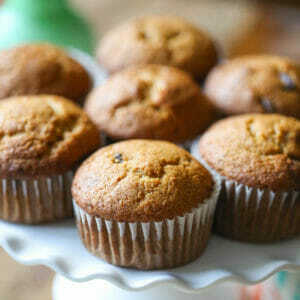 Any tips on how to keep the baked muffins from becoming soft/damp on the top after a day in the pantry? That always happens when I bake with pumpkin. I made these and we loved them!! It actually made 24 muffins and 24 mini muffins for me. Maybe my muffin pans are small? Delicious! Thanks! Yum. Semi sweet or milk chocolate chips? Delicious! My kids loved these. I got 36 muffins. Do you know the calories count of one of these? We loved these! I did half of the recipe and got 15 muffins out of it. My family loved them even more the next day. These look divine! If I don’t have applesauce, could I add more pumpkin to make up for it? Made these with the leftover pumpkin from your turkey and black bean chili and it was a perfect end to our meal. Thank you for the recipe! Looove these! It made 30 regular sized muffins for me, which was perfect because I had plenty to share with neighbors and friends and still have some for my family, too. I even subbed a cup of white whole wheat flour and they were the most fluffy and light pumpkin muffins ever to come from my oven. So delish! 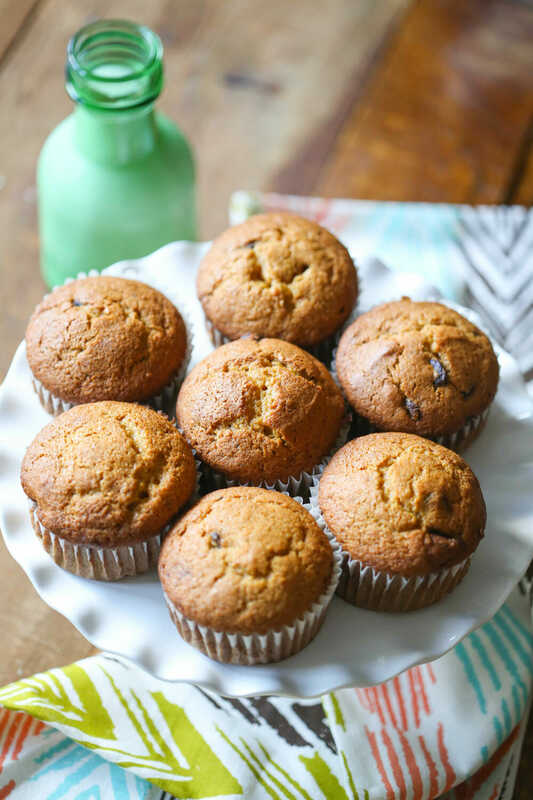 Thank you for posting a pumpkin muffin recipe that uses a whole can of pumpkin instead of only a cup! !